1-1/2" Acoustic Eggcrate Foam - Charcoal - 72"x80"
For a more economical solution to soundproofing, eggcrate foam performs well at a lower price than wedge foam tiles. With our 1 1/2-inch charcoal eggcrate foam, get a solution that offers superior performance at an affordable price. 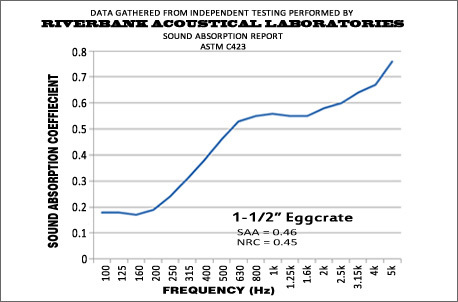 The style of eggcrate foam keeps the price down, yet it still performs well for someone needing soundproofing on a budget. It is especially practical for people planning to cover their deadening foam with acoustical cloth. We offer this 1 1/2-inch eggcrate foam in a standard size of 72" x 80" which is a great solution for a range of applications and projects. Every product we offer is made with the highest standards to ensure longevity and quality you can count on for whatever the need. The color makes it especially appealing because it will hide dirt or stains while offering a great appearance that is pleasing to the eye. If you have any questions regarding this or any of the foam products we offer, please Contact Us for assistance. Standard Size: 72" x 80"
NOTE: Size and quantity selections will affect color option availability.